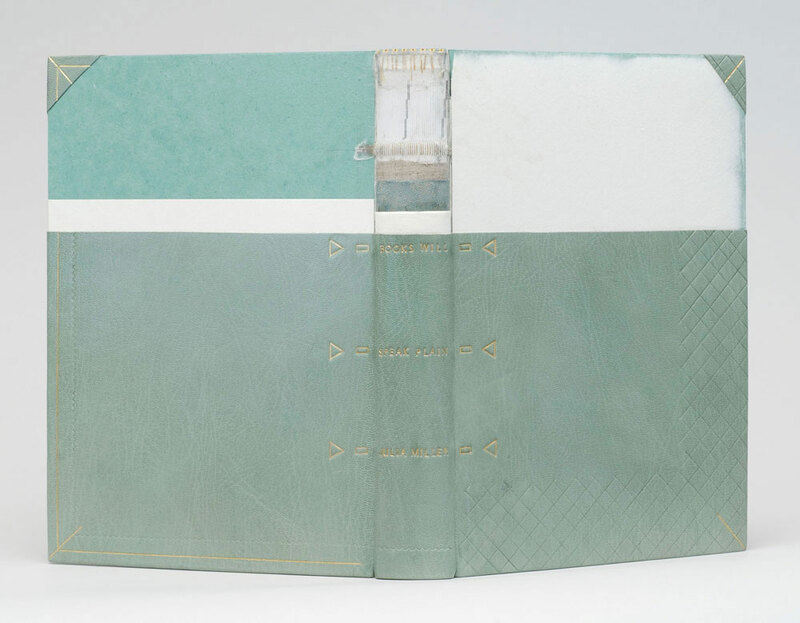 This stunning binding was created by Monique Lallier almost ten years ago. Yet the design appears so fresh and relevant to the experimentations happening with contemporary design bindings. When you land on Monique’s website, this is the binding you are greeted with and it will, no doubt, cause you to click through every single page of the gallery. The Drawings of Caravaggio by Ally Jones was bound in full scarlet leather in the French technique. The boards have been cut to reveal the red suede fly leaves through a collection of wires that have been embedded into the thickness of the board. Straddled around the top edge of the cut-out is an onlay of snakeskin. 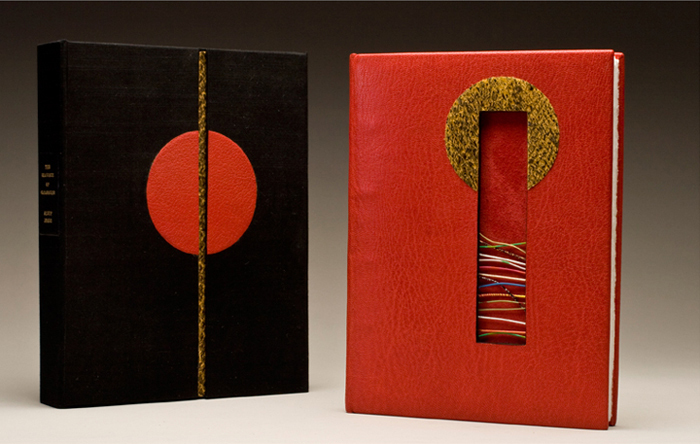 The book is housed in a box covered in black silk with matching red and snakeskin onlays. If I remember correctly you told me that this is one of the first bindings you completed and that it is still your favorite. 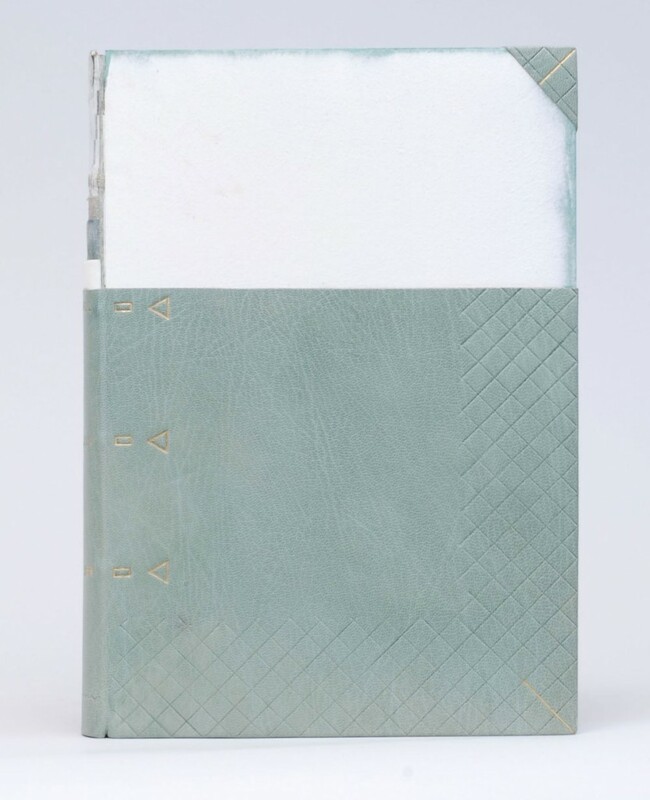 I love this binding as well for many reasons: the use of bright colors, contrasting textures from the goatskin, suede flyleaves and snakeskin onlay and the inclusion of a window cut-out of the cover. This window element is peppered throughout your portfolio. What does this element bring to your designs and why do you keep coming back to it? This binding was done in 2005. I had done the “window element” before to give space for an agate in 1985, so I suppose it evolved to an opening that was not totally filled-in like The Fables of Aesop where I have wires imbedded in the thickness of the front board and you see, through the opening to the lion stamped on the leather fly leave, or this Caravaggio, also with wires imbedded in the thickness of the boards. It was done in an advanced class for AAB (American Academy of Bookbinding) and I wanted to show the students how to line the thickness of the boards with black leather in this case. Monique’s work is awe-inspiring. Not only do I find her bindings to be so, but also her involvement in the bookbinding community. Our community and the craft of bookbinding thrives when talented and dedicated people like Monique become teachers. Between my first and second year at North Bennet Street School, I jumped at the opportunity to take a week-long private workshop with Monique at her home in North Carolina, where I absorbed everything she had to offer (no doubt an infinitesimal amount to the vast knowledge she holds). I’m really honored that Monique agreed to be interviewed for my blog, which she has complimented me about several times. So without furthering gushing, please enjoy the interview after the jump. Stay updated with posts by signing up for an email subscription. Since Monique has an ample collection of work, each week I’ll be showcasing multiple bindings including a few newly bound and unseen works! 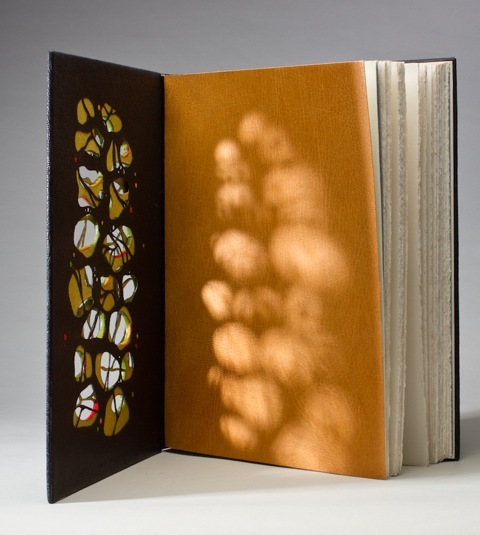 The Midwest Chapter of the Guild of Book Workers recently revealed the exhibitors for a traveling exhibition called Plainly Spoken, which celebrates Books Will Speak Plain, a comprehensive survey of historical bindings by Julia Miller. 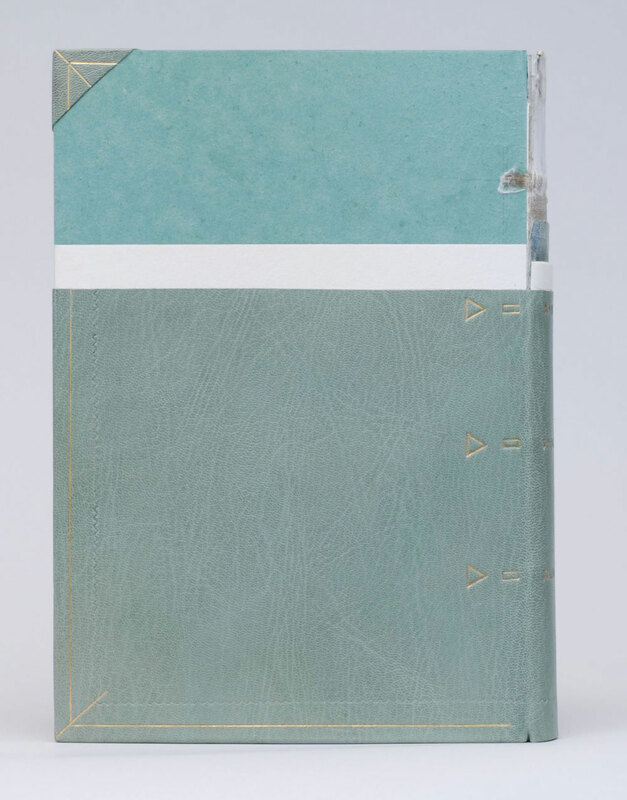 Amongst the highly skilled and wide variety of bindings is a cutaway model by Karen Hanmer. Karen bound her copy of Books Will Speak Plain as a traditional fine binding, sewn on flattened cords with laced-in boards. Partially covered in a beautiful light blue goatskin, otherwise hidden elements of the structure stay visible in this cutaway model. Tooling is done in blind and 23kt. gold foil to emphasize the location of sewing supports and lacing-on in addition to turn-ins, fills, sanding of the boards and formation of corners. The use of tooling as both an aesthetic treatment and as visual aid is just brilliant! Although the book may appear to be incomplete, it includes all the necessary details that make a book a fine binding. The headbands are hand sewn using silk thread and the head edge is sponged with acrylic inks and sprinkled with gold leaf. 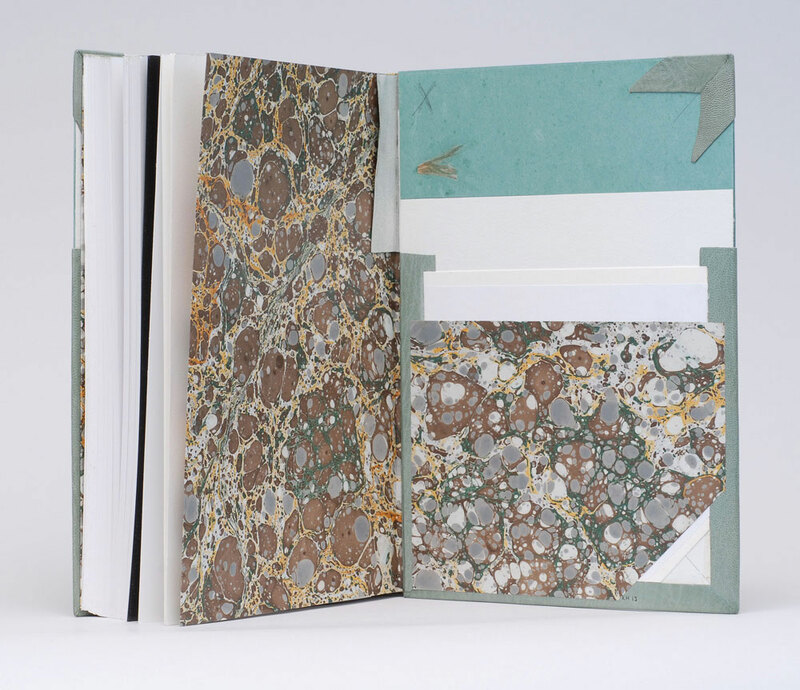 The inside continues with the cutaway theme showing off the leather hinge, marbled paper endpapers, fills and corners. How did you approach this cutaway binding? Did you study Mark Esser’s models at the University of Iowa? I’ve made a lot of partially-finished models. They’re useful for teaching and help me remember process. But cutaways are something different since they appear unfinished and fully complete at the same time. Peter Verheyen has loaned me his springback cutaways several times, and I used them for reference when making my first cutaways. I’d admired Mark Esser’s two cutaway fine bindings in the University of Iowa’s online collection for a long time and was able to spend time with them on two trips to Iowa City this spring. I was able to use my design binding on Books Will Speak Plain twice this fall: for both an online exhibit of cutaways, and in a traveling set book exhibition. For the latter I added tooling to reference the binding process: the sewing supports and lacing, the turn-ins and fills, and the board-shaping. 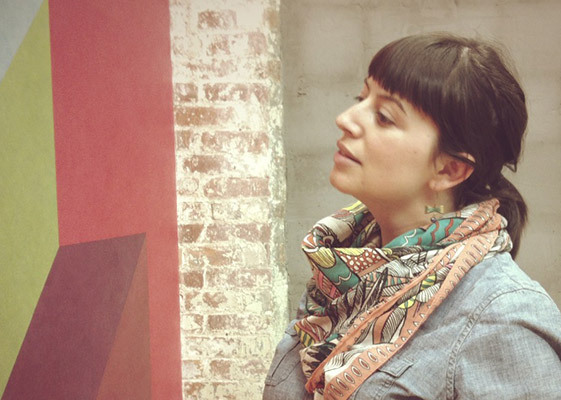 The online exhibit that Karen mentioned above, is an annual themed exhibit held by the Book Arts Web called Bind-O-Rama. For 2013, the theme was historical cutaway models. The online exhibit can be viewed here. Although I don’t know Karen very well (yet), she’s been incredibly sweet and supportive of my work. I first met Karen at her bindery in Glenview, Illinois. My friend, Anna, and I were in town for an exhibition at the Chicago Public Library; where both Karen and I had bindings on display. Since then I’ve kept in touch with Karen, leaning on her from time to time when I needed help. I’ve had two opportunities to watch her work, which is quite fun. Once when she came to North Bennet Street School to teach us the flag book structure and most recently during the Standards of Excellence 2013 conference in Washington, DC. I hope to have more opportunities like this in the future. After the jump is a wonderfully thoughtful interview with Karen, where she shares her experiences with bookbinding, teaching and marketing. Come back each Sunday during the month of December for more in-depth posts on Karen’s work in the field of bookbinding and artist books.